Sage 50 Accounting is specifically designed to meet the needs of small businesses. It’s easy to setup yet allows processing of large volumes of financial data and trading in foreign currency. Get complete control of your customers, suppliers, VAT, and finances with Sage 50 Accounts software. 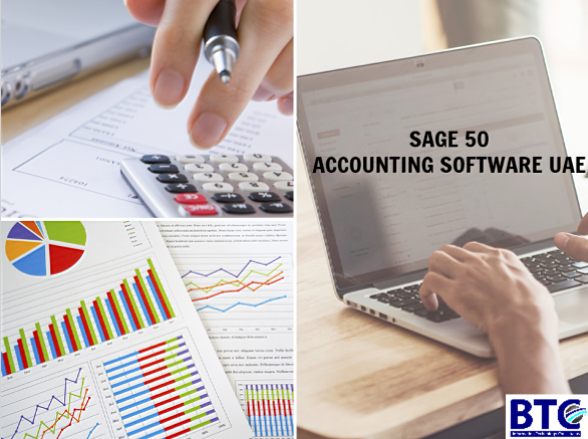 Sage 50 Accounts gives you the power and productivity of small business desktop accounting software, with the freedom and security of the cloud. Sage 50 Accounting software lets you manage your accounts, update your bank records, and stay cash flow positive. And, if you do business outside the Middle East, you can integrate a Foreign Trade module to support multiple currencies. With Sage 50 Accounts, calculating, verifying, and submitting VAT returns is easy. Store all your product and service information, raise quotes and invoices, and record sales, seamlessly and conveniently, within Sage 50 Software Solution In UAE. Track expenses, send invoices, pay employees, manage inventory, receive payments, control cash flow, and prepare taxes – all in one place. Analyze your business and make well-informed decisions with a selection of reporting templates. Or build your own with our simple drag-and-drop designer. With Sage 50 accounting software, you can get accurate real-time insight into your company’s finances, collaborate with your team regardless of your location, and reduce business expenses. Our technology ensures your data is automatically backed up, so you won’t need to worry about losing important information. Sage accounting software makes it easy to control your finances on the go. Small businesses with up-to-date accounting records are far better at making informed, educated decisions, based on current facts. It’s essential that you allocate some time every week to updating your books. With the right software, you needn’t spend more than a few minutes a day, but it won’t be long before your business starts reaping the rewards. Keeping your records up to date helps you create and maintain a solid and reliable idea of progress—making it easier to see if you can pay yourself and your employees this month. Creating a monthly budget until the end of the current financial year—and then tracking and updating your provisional figures with the real ones as they come in—helps you monitor progress against your plan, and adjust your plan to improve future performance. Time is one of your most important resources—you’ll know that better than anyone. One of the most important skills you need when running a small business is time management, with an acute understanding of how to effectively prioritize the most important tasks. Moreover, in the service industries, you need to rigorously track how much time your employees spend on each of your client accounts, and ensure that it’s reflected in the amount you invoice them each month. Spending too much time on accounts that aren’t making any profit is a costly mistake. Tracking how much time is spent on activities that can’t be attributed to any one account can make a big difference to your cash flow. Understanding these costs properly—being aware, for example, that an external consultant costs more per hour than an employee—and taking action means you’re in a better position to act decisively and drive costs down. As the leading Sage Partner in the UAE, our Sage Certified Professionals are always ready to provide you with high quality service and technical support to ensure you get your business running smoothly. Get Sage peach tree in UAE or Sage 50 accounts with BTC.